I would like you to meet Piggy. Or, as JSL calls her "Piggy Oink-Oink" using snorting noises on the hyphenated part of her name. 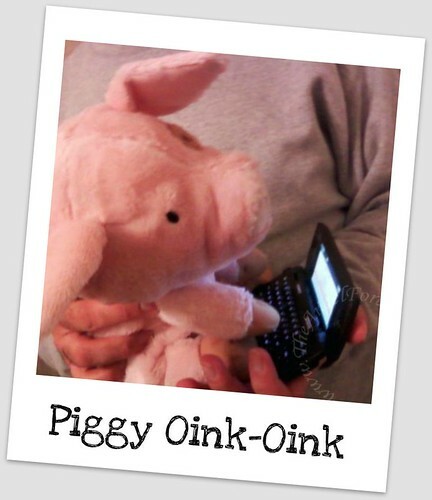 This is Piggy taking a moment to text message her friends on Twitter. Way back in October/November, when we were bribing NHL to go to swim lessons, he asked for the Mouse from Kohls Cares for Kids. The deal was to go in the pool with no issues two weeks in a row and we would buy him the Mouse. Of course, when you buy NHL a Mouse, chances are JSL will want something too. Rather than pick the Moose, JSL quickly demanded the Pig. I figured that Piggy would become like every other stuffed friend in our house – a dust magnet. 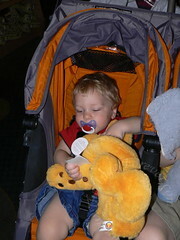 Seriously, neither of the boys had ever snuggled a stuffed animal. We would buy them for special events, like at Disney World, but they would rest on their beds with perfect fur. There must have been something different with Piggy. Since she came into the family, Piggy has been all over. As we noticed how attached JSL was with Piggy, we realized we should probably buy a Piggy Part Deux, just in case something should happen to the original Piggy Oink-Oink. The day before Thanksgiving JSL and I went to Kohls and picked up a back up Piggy. Piggy goes near and far, to the couch and in the car. He is often on the floor and is a favorite pillow or wrestling buddy. After a month or so, we noticed how loved Piggy has become, she is the first stuffed friend that has matted fur in our house. 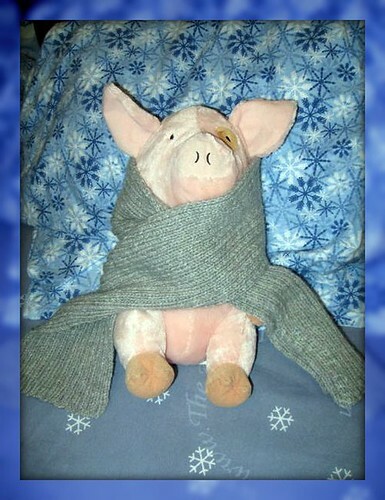 JSL loves her so much that he even allowed Piggy to try on his new scarf that I made for him. Here is Piggy modeling the scarf. 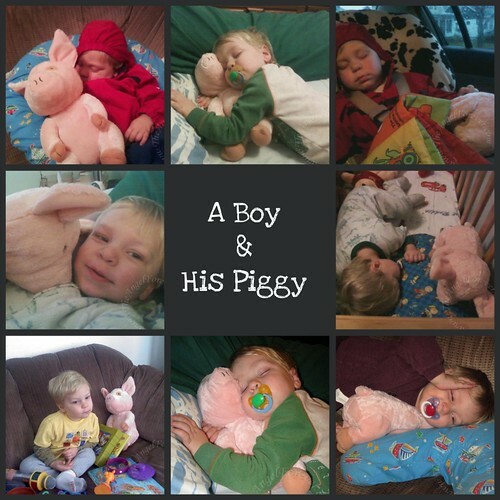 His love for Piggy makes me wonder. Perhaps there is more to this love for Piggy Oink-Oink. This may be my little guy following in my footsteps. After all, I had several Miss Piggy (a la Muppets fame) dolls that went all over with me and collected pigs growing up. Must locate photos of myself with Miss Piggy from years ago at Nana & Papa’s house to compare to photos of JSL. Isn’t it funny how kids just bond with the most surprising things? Piggy Oink-Oink is so cute! 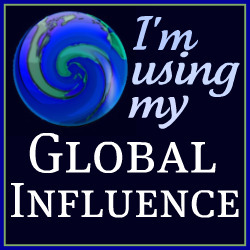 .-= kailani´s last blog ..Blogger of the Week – Our Seven Qtpies =-. Now that is a well loved pig! Our daughter has so many stuffed animals that we culled through and got rid of half, and she didn’t notice! Those pictures just make me smile. So sweet. 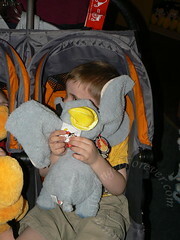 My son had something like this with a bear. My daughter never loved just one animal like that. I love pigs too, so it must be genetic! 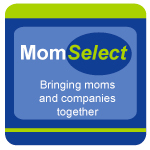 .-= qcmama´s last blog ..A Survey from "Aunt Becky" =-.